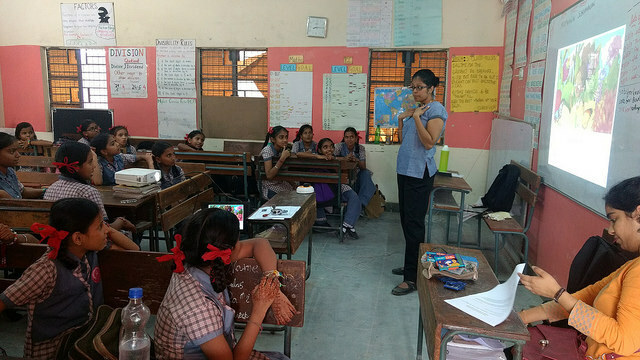 Riddhi Dastidar, Outreach Team member shares her experiences from a recent storytelling session at a Teach for India classroom in Delhi. Recently, I found myself making my way to a grade 7 classroom in South Delhi where a room with brightly colourful walls, filled with little girls with red-ribboned hair, smiling faces, and questions in their shy eyes awaited me. We walked in as Sameera ‘Didi’ was finishing up a lesson. Sameera is a lawyer turned Teach For India Fellow. Teach For India’s vision is that one day all children will attain an excellent education. In 2016, Teach For India impacted students across 353 schools in seven cities across India. We were there to share Mathangi Subramanian's 'A Butterfly Smile', a story that follows the journey of little Kavya who has just moved to the big scary city of Bengaluru from her native village where her parents used to be farmers. Now they live near a noisy construction site far from the colours and butterflies of her old home. She decides to venture her knowledge about butterflies on a class-trip to the butterfly garden and in the process begins to find a new sense of belonging. This story was especially appropriate for a TFI classroom, where the message is always that right outside your comfort zone is where the magic can be found! 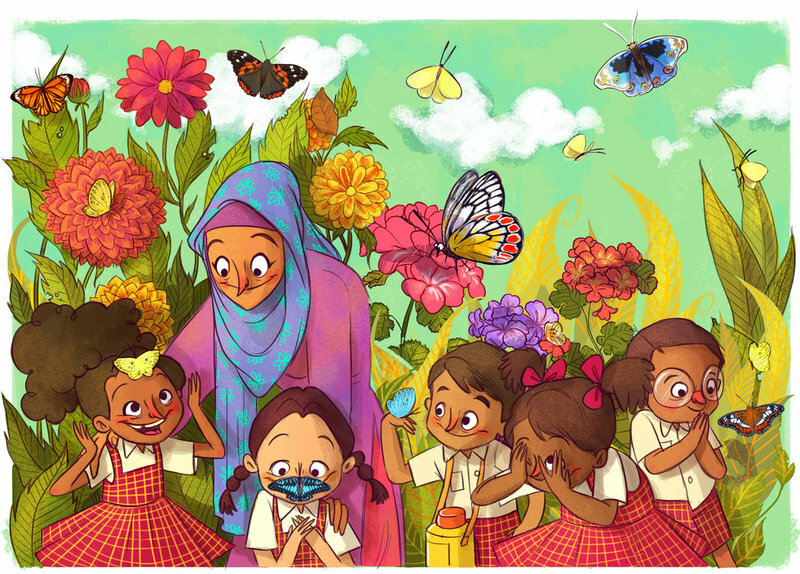 On this day, Mathangi and the children read the story together, and the children filled in facts that they already knew about butterflies. We discussed what it felt like to be new, to move somewhere completely different and what helped them to be brave like Kavya in a tough situation! “I wrote my first story when I was five and I published my first book when I was 35 – so it took me 30 years!” Mathangi told them, blowing their minds. “I like telling stories but it takes a lot of work and patience to become a writer. It comes from watching how people who are different from me live- so with this story, I was walking down a street in Bangalore and noticed some kids playing in a construction site…"
We discussed the research that goes into deciding what to write about and all of the little tiny everyday observations that go into the creation of characters and books. Observation and listening were superpowers the girls were trying to practice in their own lives too. “It’s sometimes about meeting people, sometimes about reading things- but it’s mostly about seeing everything in the world”, Mathangi shared. After the session, we said goodbye with many hugs and waves, but the conversation continued. The girls compared and contrasted their lives and the things that made them brave, as shy 7 year old babies to now as 12 year olds who feel capable of taking care of themselves. After Mathangi’s revelations on how being a careful observer played a big role in her life as a writer, the children picked up this thread to talk about where they observed and absorbed things from- from their families and homes to the increasing influence of their peers, teachers and the outside world as they grew up. Some brought up the point that while as a norm, parents want the best for them and were where they got their brave from, sometimes they could be wrong too. Some of the girls brought up the subtle ways in which their gender sometimes felt like a cocoon of the limiting kind instead! This is the role we hope to play with our STEM books - to get children thinking about science, themselves and their connection to the world around them - and to leave their brains buzzing and the ideas and words flowing- long after we leave the room, or the last page of a book is turned. You can read A Butterfly Smile in 5 languages on StoryWeaver. You can see more photos from the session here. We are looking to scale up content on StoryWeaver and add about 20,000 new stories by December 2019. In order to achieve this target we have several projects starting up and so we are currently, we're looking for a full-time, Project Assistant to join our Digital Team in Bangalore to help keep these projects on track. Coordinate with and oversee external vendors to ensure timelines and quality. Salary will be commensurate with qualifications and experience. Please send your resume to storyweaver@prathambooks.org with 'Project Assistant for StoryWeaver' in the subject line of the email.